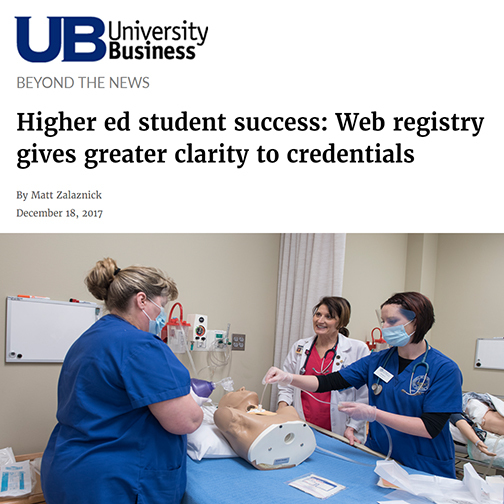 A new web-based registry launched by Credential Engine in December gives students, educators and employers the means to search the competencies and skills that go into a specific credential, certificate, diploma or degree at a particular school. The registry includes approximately 1,500 credentials from Rio Salado and 170 other colleges, universities and educational institutions. Learn more in this University Business Magazine story by Matt Zalaznick. “It’s going to be more about looking at industry sectors and creating credentials, certificates and degree programs that are clear pathways to work,” said Rio Salado’s president, Chris Bustamante who is quoted in this story. For more details about the registry visit www.credentialengine.org.